Joseph C Kenny Plumbing & Heating supplies and fits hot water cylinders from leading manufacturer Gledhill. StainlessLite Cylinders are ideal for all hot water applications and are made from 100% recyclable Duplex stainless steel providing outstanding efficiency and an exceptionally low standing heat loss. The corrugated tube, inside the cylinder, increases the heating surface and creates turbulence which gives a 20% better heat exchange than plain tube. The extra thickness of foam provides a cylinder with extremely low standing losses. A new design of cold-water inlet diffuser has been developed which improves the hot water performance. The end result is that the hot water output is equal to the capacity. A 180 litre vessel will produce 180 litres of hot water! Joseph C Kenny Plumbing & Heating will advise you on the best cylinder to fit for your home, whether you are replacing an old cylinder or require a system for your new build or refurbishment. 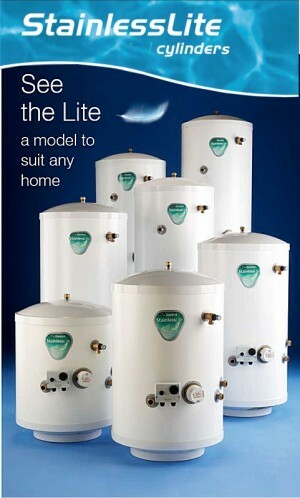 The cylinders can be fitted with oil, gas or electric boilers or solar panels. Both vented and unvented cylinders with direct or indirect fittings are available. The only difference between the vented and unvented range of stainless steel cylinders is that instead of being supplied with the unvented kit, the vented option is supplied with a control thermostat and a drain valve. Contact Joseph C Kenny Plumbing & Heating for your new / replacement hot water cylinder today. Manufactured in accordance with BS EN 12897 - the specification for water storage vessels. Organisation for Technical Approvals (EOTA), and found to comply with Building Regulations G3 and Water Regulations. In performance, the cylinders comply with the requirements of BS6700 and meet the NHBC criteria for domestic properties. Gledhill also operates a quality management system audited and accepted by the BSI in accordance with BS EN ISO 9001:2008. Industry leading low Global Warming Potential (GWP) of 0.7 (vented cylinder) and 1 (unvented). High limit thermal cut-out operates at 85°C wired in series with two port motorised valve. Manually re-settable cut out on heating element. All models have a temperature and pressure relief valve factory set at 6 bar and 95°C. Supplied with two immersion heaters for off-peak and on-peak use, these cylinders are the ultimate lightweight, easy to install answer for electric hot water options. The indirect range has high efficiency corrugated tube coils to give much faster re-heat times than can be achieved with plain tube coils. All tappings are within a 90 degree segment to make installation easier. An electrically heated cylinder with a high performance solar coil. It is capable of meeting the requirements of ADLI, provided that it is matched to the panels and the hot water requirement correctly. Cylinders heated from conventional boiler (oil or gas) are provided with a second high performance coil for solar use.